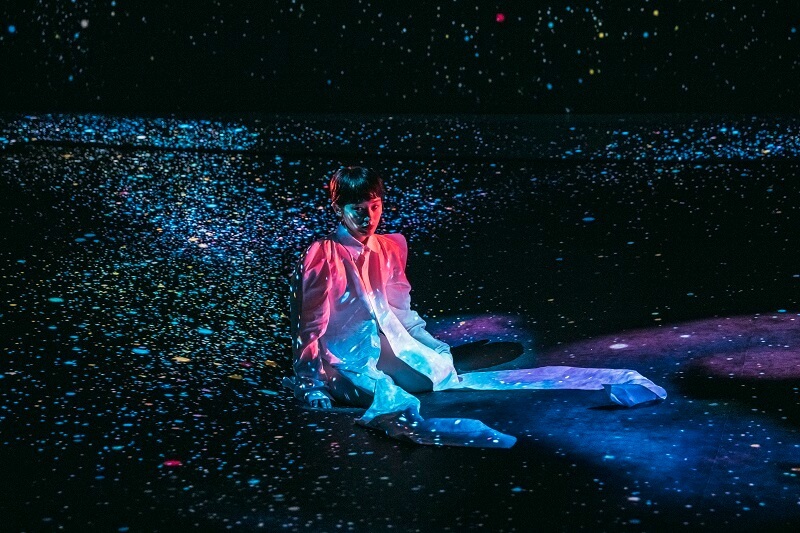 Wednesday Campanella held a live performance at MORI Building DIGITAL ART MUSEUM: teamLab Borderless which is currently gaining widespread attention. The first song of the night was Gogh, which made use of teamLab’s Multi Jumping Universe artwork that recreates the life cycle of stars in the universe. 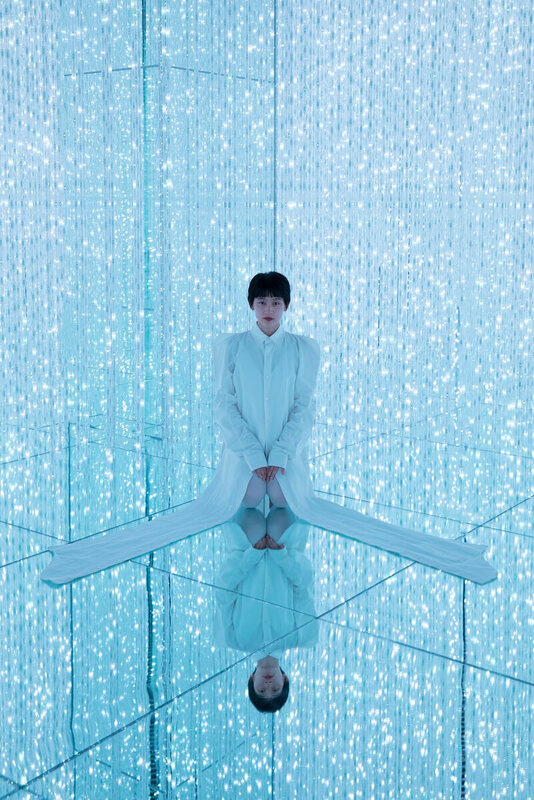 From within the starry spectacle of space appeared Wednesday Campanella‘s vocalist and sole performer, KOM_I, who was dressed in a white outfit. She ran around freely within teamLab’s ‘Athletic Forest’ environment. Kento Yamada, who directed the group’s music videos for The Bamboo Princess and Matryoshka, followed her around stage with a camera. Next on the set list was Matilda. For this song, teamLab’s Graffiti Flowers Bombing was used, where flowers were drawn in graffiti across the surface of the wall. This moved onto Flower Forest: Lost, Immersed and Reborn, where KOM_I danced amongst an unending kaleidoscope of colours. As the chorus for the third song The Bamboo Princess approached, bamboo thickets appeared, bringing to life the world of the music video. KOM_I sang the lead track of the group’s new EP Galapagos with passion under the glow of the moonlight. She subsequently performed Momotaro (Okinawa Remix) which has become a live staple. 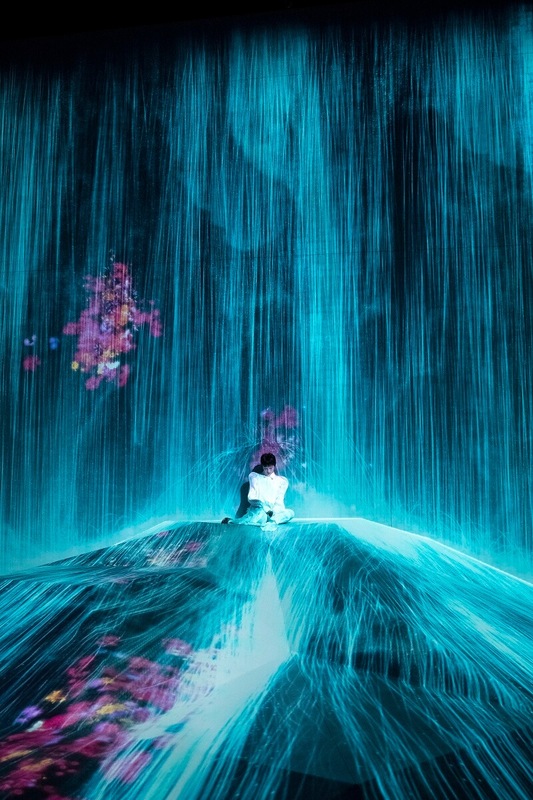 This was done within teamLab’s Black Waves – Continuous as the performance became more and more vibrant, matching the movement of the waves. KOM_I glided along a mirror floor – the audience could not take their eyes off her. Wander through the Crystal World fit perfectly with the mysterious song The Sand Castle during which KOM_I sang while roaming through star droplets. Minakata Kumagusu was performed with Crows are Chased and the Chasing Crows are Destined to be Chased as well, Transcending Space where the stage warped into a zero gravity space at the flight of a crow. The final song of the set was A Cat Called Yellow which was graced by Universe of Water Particles on a Rock where People Gather. Immense waterfalls flowed as KOM_I sang quietly before the show wrapped up. This concert was streamed live on Abema TV where 90,000 viewers arrived to see the spectacle. The performance can be watched in its entirety here. With Wednesday Campanella’s two-day concert at Kawaguchiko Stellar Theater on June 30 and July 1 out of the way, KOM_I is now getting ready for the Galapagos Tour. What has she got in store for us next? Permanent exhibition since June 21, 2018.